IKWYL | What Does IKWYL Mean? 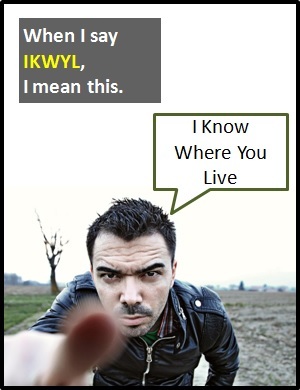 IKWYL means "I Know Where You Live". The abbreviation IKWYL can be used as a simple confirmation that the sender knows the address of the recipient. However, it is often used as a threat of violence and implies that the sender knows where to find the recipient and could attack them there. The 1995 American film "Tommy Boy" featured the line: "I know where you live and I've seen where you sleep. I swear to everything holy that your mothers will cry when they see what I've done to you." IKWYL is often a menacing statement. Alex: I haven't got your money. Daniel: You'd better be joking. Don't forget IKWYL. Anna: Can you pick up the sofa tonight? Karen: No problems. IKWYL. I'll be there at 7pm. IKWYL is an initialism abbreviation. Technically, this means it is pronounced using its individual letters (i.e., "Eye Kay Dblyoo Why El"). However, it not spoken using its letters. IKWYL is an abbreviated sentence, usually delivered with menace. Before the digital era, we would have just said "I Know Where You Live" instead of using the abbreviation IKWYL.